What is the Eisenhower Matrix? 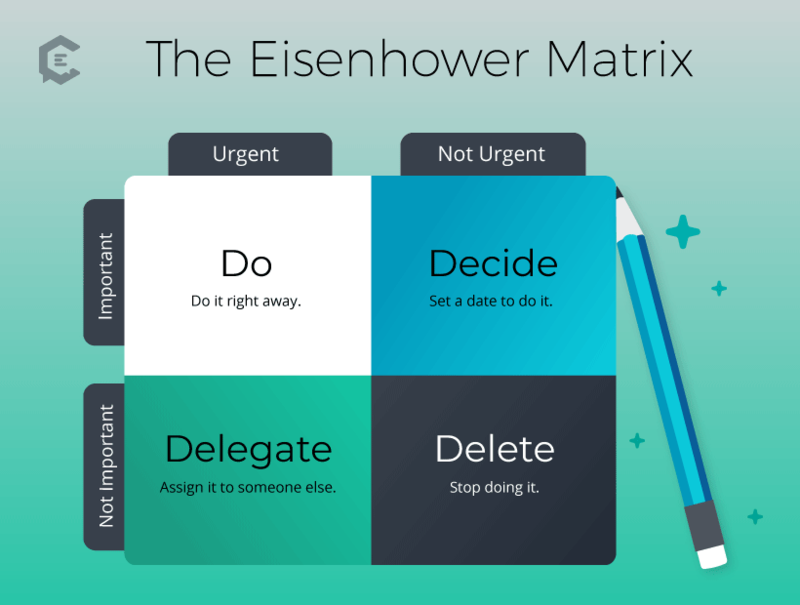 Invented by President Dwight D. Eisenhower, the Eisenhower Matrix is a simple productivity tool for organizing and prioritizing tasks into four categories by degree of importance and urgency: 1) Do 2) Decide 3) Delegate and 4) Delete. For a variety of reasons — some external, some self-imposed — freelance creatives tend to be constantly juggling many tasks, and always looking for better ways of managing them. We know that procrastination, Imposter Syndrome and general aversion to a blank page — or even a draft — are nearly universal among writers. And we generally will overcome it when the time is right. But even if you’re fabulously free of writers’ block, knocking out articles twice daily, you’re probably still not free of the to-do list. There are appointments to set, sources to find, paperwork to file, and then an entire long list of family stuff to take care of… and probably a sadly overlooked column of tasks labeled “self care” that hasn’t changed in the past several months. We’ve discussed creative and productivity tactics before on this blog, as well as an original approach to time management. We’ve discussed theories like the Lazy User Model, and how to use that human behavior to your advantage. We’ve given you tips from experts. Pointed out productivity apps. And now we’re here to show you the Marie Kondo of the to-do list, which actually existed long before Marie took over our Facebook feed. Presenting the Eisenhower Matrix. Yes, as in, the former President Dwight Eisenhower. He invented it. It’s incredibly simple, in design and practice. Many people call it the Eisenhower Box, perhaps because that humble moniker suits it better than a word everyone associates with Keanu Reaves sci-fi. No matter what you call it, the concept provides easy organization of all incoming tasks. Make a simple criss-cross that creates four sections. Give each section a label: Important, Urgent, Not Important, Non-Urgent. So instead of putting the to-do list down in stream-of-consciousness, you categorize things according to: 1) how much they matter to your life and 2) how time-sensitive they are. It’s easier than most task-scheduling apps or systems, and it works well with the creative thought process, which tends to intuit using gut feelings whether something is important or not. The issue most creatives have is knowing, if something is not important to us, should we still handle it? Eisenhower’s answer is no. But not a simple no. Then, have a look at your Important categories. Whatever’s Important/Urgent, the Eisenhower system says you do right away, before even thinking about the rest of your day. This is somewhat in step with the also-genius Eat That Frog productivity theory, which suggests that the least pleasant task on the to-do list is should be your first thing to do every day. Eat That Frog, true to the name, simply theorizes that if you do the worst thing first, the rest of the day will get easier. Which brings us to the next box: Important/Not Urgent. With this box, you decide. Specifically, you give yourself a date, by which time you have to move the item to one of the other two boxes where things get done. This is quite helpful in scheduling deadlines and timelines, because it lets you know when a not-so-urgent assignment becomes urgent, so you aren’t as prone to forget. Also, it brings us to the most life-changing section of the box. Urgent/Not Important. This is, in some ways, the hardest stuff to categorize, but there are a couple ways to do it. First, how do you feel about it? Do you feel like it’s personally a big deal? Second, will it help if you are hands-on with this thing? For example, doing your expenses. Maybe that particular task is so soul-sucking and time-consuming, you would rather give it to a “numbers person” (yes, they exist). Or, maybe there’s a presentation that needs doing in Keynote or PowerPoint, but you are not great at those tools, so it’ll take you a full day. This is where Eisenhower tells you to delegate. Yes. Hand off that task that you must get done but don’t necessarily need to do yourself. Delegating isn’t just for generals or mid-senior level corporate directors. It’s for everyone! You, too, are allowed to delegate. In fact, you must. Some freelancers are so used to being solo machines, they just don’t realize that this is a strategy that they can definitely employ. It brings lower costs than one might realize, in so many different areas of life. And you actually save money in the long run, because you can use that saved time to make money using your core skills. Bookkeeping — Some independent bookkeepers have rates as low as $100 monthly retainer for independent contractors and small businesses. Social media promotion — Entry-level cost for freelancer or agency: $125/month. Inputting new business card contact details and sending a followup note — Again, this could be a job for a VA, or perhaps a one-day-a-week in-office assistant. Once we stop seeing a to-do list as a personal set of markers that must be personally accomplished and crossed off, and instead start separating it into categories we should or shouldn’t personally handle, we actually increase our ability to get through it. And we increase our ability to delegate — because, yes, it’s somewhat of a learned skill. There are definitely big-ticket creative to-dos that are much harder to delegate, specifically website/blog upkeep and presentation design, but it is absolutely worthwhile to find subcontractors in these areas who are within your budget. Once you find them, they’ll not only make you look more professional, but you could even start pitching for bigger projects together. Just to inspire/give a guideline: A fast-working presentation designer can pull together a pitch deck of 10 pages in 3 hours. It could cost $100-150. And it will look slicker and more cohesive than what a non-design-trained writer could painstakingly drag-and-drop together in Keynote in 8 hours. I speak with the knowledge that comes through vast experience. This aspect of the Eisenhower Box also aligns with the guiding theory of the Lazy User Model. This delightfully-named theory (also a not-so-delightful study in human nature) found that when most people are looking for a solution to a need, they tend to choose the solution that meets their needs with the minimum amount of effort. You’ll note, I said most people. Writers are not most people. We tend to be over-analytical, over-curious — testing four different apps where one does the job, or contacting five sources because we need two to come through. The Eisenhower Box guides us to be lazier but at the same time, more productive: Don’t test four design apps, or any design apps, when you need to design some Pinterest pins. It’ll take up your whole day. Send that whole task off to a Canva specialist and don’t think about it again till the specialist sends it back for review. Another productivity theory you can marry with the Eisenhower Box to life-changing effect is my colleague (and oft-quoted ClearVoice expert) Erik Sherman’s Rate + Weight method of evaluating clients. If you haven’t read through this, here’s the short description and here’s the infographic. It’s based on the principle that freelancers should score their clients in a number of categories (chosen based on the freelancer’s priorities); and assign them weighted rankings, and then dump the lowest-scoring one. It’s an analytical method for proving the gut sensation that a client brings nothing good into your life. And it’s empowering. But how often we think of clients with dread is an emotional, messy thing. How often they show up in the Eisenhower Box as Urgent-Important and fill you with hatred of the work is another thing altogether. The shortcut to a happier and more productive life might just be: Do your Eisenhower Box for a few weeks, and if the same client is showing up in Urgent/Important weekly, and they’re not paying your bills singlehandedly or close to it, then it’s time to delete. And with all the free time you now have? Move with your newfound efficiency into the 100 Rejections Challenge, and you’ll replace that dread-feeling client with an exciting new one before you know it.